Albert Nerken School of Engineering students with an interest in improving healthcare and well-being earned multiple prizes in a variety of ways over the past weekend. Giovanni Sanchez and Ruchi Patel, two seniors and creators of QuickStitch, a rapid wound-closing device that operates like a medical stapler, took both First Prize and "People's Choice Award" at the 2017 SASEtank, an entrepreneurial competition established by the Society of Asian Scientists and Engineers (SASE). At nearly the same time, Yifei "Simon" Shao, a mechanical engineering junior, and other collaborators, won a $2500 prize at the Mt. Sinai Health Hackathon for a device they designed (in 48 hours!) to assist people with mobility problems to get into and out of cars. “That current Cooper Union engineering students produce prize-winning innovations aimed at improving the lives of others is gratifying but comes as no surprise,” Anita Raja, associate dean of research and graduate programs at the school, says. “The Albert Nerken School of Engineering purposefully integrates real-world problem solving and the notion of engineering as a service into its programs. We expect graduates and students to make the world better." 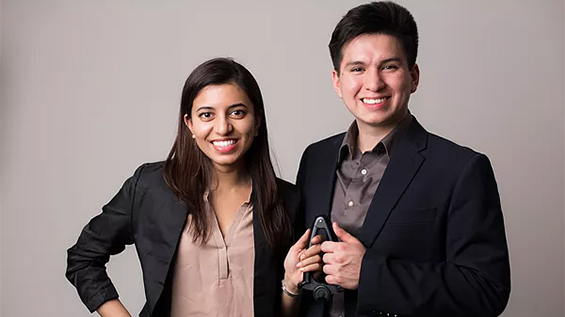 Giovanni Sanchez, a mechanical engineering major, and Ruchi Patel, of the chemical engineering department, first developed QuickStitch in 2015 as part of that year's Invention Factory, where they won the top prize. (The co-second-prize winners from that same year recently won $100K for their origami solution to replacing the disposable coffee cup top.) Back then QuickStitch was called SutureSelf. It allows non-medically-trained people to suture themselves or others with one hand using a low-cost tool. Since winning in 2015 the students incorporated as SPARIO, Inc. and have appeared on CNBC's "Make Me a Millionaire Inventor,” a reality show that highlights promising new inventions while matching inventors with potential investors. The SASEtank competition began a year ago, with three rounds of judging. The winners were announced at the SASE national conference in Chicago. QuickStitch had stiff competition, not least of all from another Cooper Union team that made it to the final four of SASEtank. 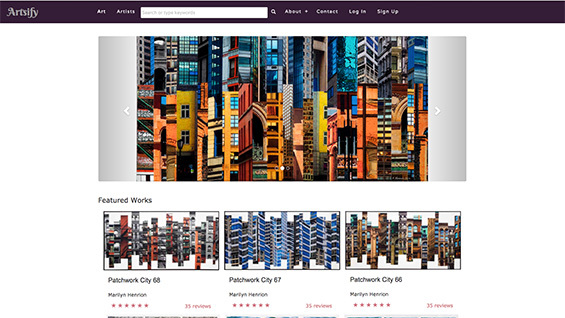 Artsify, a website developed by Lily Lin BSE'17, Xiaowen "Angel" Zhang EE'17, and Sehr Ahmed EE'17, would be an online gallery and marketplace allowing artists to share and sell their works. It was developed by the teammates in their Interdisciplinary Senior Project (EID 365) class last year. They were inspired by a pitch from Cooper alumna, Marilyn Henrion A’52 and Pete Congleton, director of gift planning, who envisioned a space for alumni to sell their artwork, and as a means of facilitating gifts of artwork for the benefit of The Cooper Union. Individual artists could benefit from their affiliation with Cooper, and potentially valuable gifts of art from artists and collectors could be graciously accepted without as much concern for the requisite costs associated with display and curation of an art collection. The Artsify team had assistance from Jean Chung, adjunct professor at the school of engineering, Howie Rosenblatt EE’91, owner of an entrepreneurial company called Precubator, and Mike Essl, acting dean of the School of Art. Though a demonstration website was launched for the purposes of the SASEtank competition, the application requires further development and funding to become fully functional. Meanwhile, in New York, there were no less than eight Cooper Union engineering students competing at the Mt. Sinai Health Hackathon working on topics ranging from low-cost devices to detect biomarkers in saliva which are indicative of breast cancer to minimally-invasive techniques to remove tumors. Simon Shao worked with members of Mt. Sinai, Rensselaer Polytechnical Institute, and Stevens Institute of Technology as team "Helping Stand." 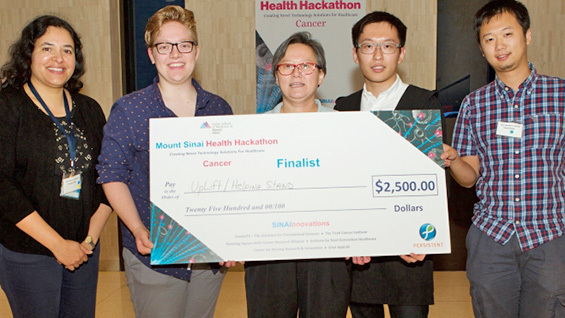 The rules of the competition were to create a minimum viable product, service or solution for any problem related to cancer. The Helping Stand team created a portable device to assist fatigued and/or debilitated patients with getting up from a seated position in an automobile. They are investigating the possibility of patenting the device so they prefer to keep the details private at the moment. Suffice it to say they won $2500 as one of three finalist teams who will be invited to the Mt. Sinai Innovation Showcase in February 2018 where they will present their work and get feedback from a team of judges.